Use different finishes and bead colors to create variety with a wine charm set with the same logo. Wine charms are not just for wine glasses? Some clients have used them on coffee mugs, and beer bottles! Custom wine charms are the perfect accent to make your event special. 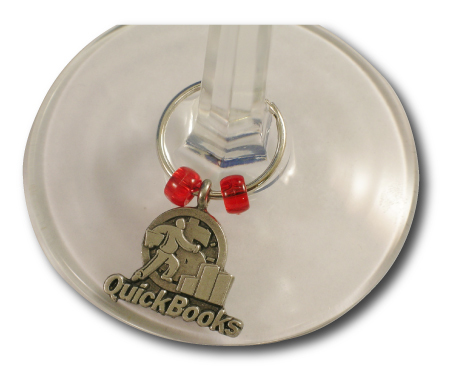 Whether it's a corporate celebration, a wedding, or other promotional event, a custom wine charm with your design or logo is a lasting reminder of the event. We have been producing custom emblems for events like yours for over 40 years. At Custom-Wine-Charms.Com we understand that your charm is a lot more than a give-away. Your custom charm says a lot about you and how you feel about your guests. We bring this understanding and commitment to our customers into every job we produce. Because we produce our charms in our own factory, we maintain tight control over every aspect and can insure the highest quality product will be on your glass. "our charms were the hit of our event! Thank You, Thank You Thank You"